Swamp girl s stat. 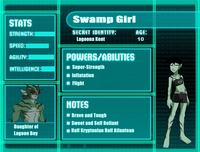 Swamp Girl aka Lagoona Kent daughter of Lagoon Boy and Supergirl. Half Kryptonian Half Atlantean aka Krypt-Lantean. Images in the Young Justice OC'S!!! club tagged: photo young justice lagoon boy supergirl swamp girl dc heroes. Spamin' Duh imagens With My Girl! Mel's spreadin duh natal cheer! Spamming the imagens with Twan!!! !